An timely account of a raging debate: The history of the ongoing struggle between the presidents and Congress over who has the power to declare and wage war. ...provides a trenchant counterargument to the idea that wartime presidents are pretty much omnipotent ... With an ambitious sweep and brimming with subtle insights, Waging War is a deep history and a thoughtful inquiry into how the constitutional system of checks and balances has functioned when it comes to waging war and making peace. Barron’s argument — bolstered by a sure grasp of constitutional debates and the ongoing struggles pitting the executive against the legislative and judicial branches — is both surprising and oddly reassuring. Members of Congress in particular would do well to absorb it. ...[a] fine and detailed history ... The stories are terrific, though one has to fight through an immense amount of narrative detail for any broader analysis of what was going on ... David Barron has given us a rich and detailed history, and not the least of its riches is that it occasions these thoughts about why it is Congress and not just any old institution that faces off against the president in wartime. Much of Barron’s story, whether he wants to admit it or not, is about how presidents have ignored Congress, circumvented Congress, or gained Congressional support by cajoling, threatening, or outright lying to Congress. Barron does not explore this as he might ... All of these omissions, in just the modern period, undermine the analysis and argument of the book ... The many omissions in Barron’s history — some I have already noted and others I will discuss below — are compounded by the book’s incredible sloppiness. Barron severely undermines his own credibility and his arguments throughout the book with a history that is often factually wrong to the point of being useless or misleading ... Beyond these (and many other) errors, Barron fails to examine key moments in US history when unilateral presidential leadership — including the use of force or the threat of force — mattered. 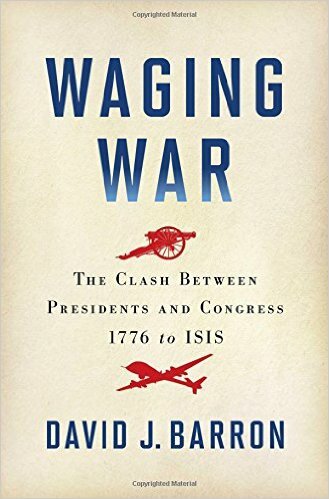 What did you think of Waging War: The Clash Between Presidents and Congress, 1776 to ISIS?